Cheese cake is one of our favourite desserts, so far. However, those rich heavy cheese cakes are often too creamy, making me a little sick after having the entire slice… Well, this inspired me to make my own cheese cake. So, I made this cheese cake with my favourite yogurt added into it! Adding yogurt is not just my personal preference, it is also to help to reduce its sweetness as well as making my cheese cake a lighter bodied one. Yes, a lighter body cake, but never afraid of losing its aromas.. This is a simple cake which you can make one easily anytime, as wished. Yes, another reason for using yogurt is to replace the heavy cream. I’ve opted out the heavy cream entirely, just to reduce the calorie intake (chuckling)! No worries about the texture of this cake without heavy cream, it’ll still feel so smooth afterall, I promised! 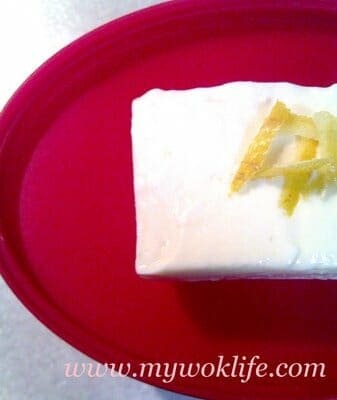 This Yogurt Lemon Cheese Cake counts 220kcal for a square piece (about 80 gram). Adding of lemon julienne creates a zesty relish while the refreshing taste of yogurt helps to reduce ‘too-creamy’ feeling, even after a big slice of it. Such combination extends a pleasant sweet-tangy aftertaste to the palate. It’s simply yummy! 1) To make crust, coarsely chop digestive biscuits. Mix with butter, and finely crush biscuits with fork. 2) Line 6 x 6-inch baking pan with cling wrap, with slightly extending over all sides. Press biscuit mixture firmly onto the base. Store it in the freezer. 3) Mix gelatin into warm water. Let is set down for 5 min, and then stir it till dissolved. 4) To make filling, put cream cheese, yogurt, sugar and lemon juice and dissolved gelatin into a large deep bowl. Beat mixture with electric mixer at low speed until well blended and smooth. 5) Take out pan of crust from the freezer. Spoon filling over crust. Use the back of the spoon to smoothen the surface of cake. Sprinkle lemon zest on top, or as garnish. 6) Cover and refrigerate it for at least 2 hours, or until firm. I made this cake the night before, and it took me less than 30 min to complete. I stored my cheese cake in refrigerator, yes overnight, since it was to be consumed the next morning. The cake together with cling wrap, was easily removed from the pan. Otherwise, it’s more advisable to use cake tin with removable base. That way, you don’t need to place the cling wrap underneath, and risk your cheese cake with ‘fine lines’ engraved on the sides of the cake caused by the wrap after refrigeration. You may even serve the whole cake on the cake tin base! I divided the cake into small squares, and brought some to work to share with my colleagues. The rest was kept for my family’s supper. I was so happy that my cheese cake was well commented by both my colleagues and family, even my little one. I will try to make with different flavour next time. Tips: Use also 1/3 Less Fat original cream cheese, to further lower fat and reduce calorie, as desired. *Gelatin is available in powder form. *Vary the amount of yogurt, as desired. *Use vanilla essence (½ teaspoon) instead of lemon juice, if preferred. Vanilla flavour goes well with this yogurt cheese cake, too. * Change toppings to mango cubes, as desired. You may add mango essence to enhance flavour, too. Ok somethin must have gone wrong. I put it in the fridge overnight and it turned out wobbly still. It also tastes too much of cheese…. is it because i didnt put sugar? Hi, this looks easy, let me find some weekend to try. I used to make yogurt with Easiyo, but I find the original plain yogurt is very sour. I guess I have to use the yogurt from the shell for this recipe. I guess you had too much lemon juice and yogurt in it.. Reduce the amount of yogurt to only 1 tablespoon, and drops (or maximun 1/2 teaspoon) of lemon juice squeezed from a tiny wedge of lemon. If 1 teaspoon of gelatin is not enough, try 1.5 teaspoon. By the way, why do you need to put lemon juice when you are using flavoured yogurt? I would recommend using plain yogurt with lemon juice OR just 1 flavoured yogurt. Lastly, try to keep in the FREEZER for longer time. It does not matter as it will defrost once you bring out to room temperature or the lower compartment of your refrigerator. You are right. Use the off-the-shelf type of normal ready-to-eat plain yogurt for this recipe..
One more thing. Try a block of 250 gram of cream cheese instead of 500 gram. I think it will taste too creamy and cheesy in our palate. Don’t give up though.. Let me know if you have anymore concern and query, I will be always here for you! and i tried to save it.. i put in A LOT of oreos and it’s tasting slightly better and it is a bit harder. wait wait you mean i put the cheesecake in the FREEZER?? not the bottom compartment? so i used flavoured yoghurt and no need lemon is it? Put it in the FREEZER for at least an hour, before you transfer it to the bottom compartment. Between, why don’t you make your own crust? Making the crust with either digestive biscuits or oreo cookies is easy! Just add butter and mash it, that’s all you need. If you use oreo cookies as crust, then make your cheesecake with vanilla essence and plain yogurt ok? Just few drops of vanilla essence will do. I came to your blog becoz I read the message you left at cookingninja’s blog about non-baked yoghurt cheese cake. I love cakes especially cheese cakes, just too coward to try baking yet and so desperate when gaining weight. You can always find yoghurt in my refrigerator too and I also tried all sort of ways to have it with everything I could think of. The lastest trial is avocado with plain yoghurt earlier this afternoon. My eyes are like ‘blink blink’ when I see no bake + low fat yoghurt + cheese cake, what else can I ask for ? Thanks a lot for recipe, I’m sure will try it. Hi, I love your blog and this recipe.. It’s my first time making cakes..I followed your receipe exactly and the crust is fine. As for your issues, 7″ tray should be fine if you follow my measurement, however, if the cheese portion is really not tall enough, perhaps you may want to try a small tray. Yes. But remember if the thickness of the crust is just nice for you, you have to lessen the amount of the Digestive biscuit when using a smaller tray, so that your crust will not end up too thick. If your cheese is too soft, use a little more gelatin to hold the cheese. Alternatively, place in the freezer longer. tks so much for the recipe. I tried doing a cheesecake from a recipe found in a Simple Her magazine but found that the pan i am using is too big for all the ingredients that i have bought. What is the size of the pan i should use based on your recipe? I am new to making cheesecake and hope to make a successful one. Yes, good idea for birthday cake. Remember you may add a little bit more of the gelatin to make the cheese cake firmer, or put in the freezer as mentioned in my post..
As for topping for birthday cake, I wil suggest mango cubes… Cut mango cubes to top on the surface of the whole cake. Or, just add the mango cubes at the centre of the cake. Then, decorate with slice/ halved strawberries around the edge of the cake.. As such, you will have yellow and red colours on top of your cake.. Whoa.. it will be very nice, then! thanks for this recipe!.. it’s great! I think the 1st time i use jacob oat biscuit..& put the normal cream cheese, but put too much vanila essence..it became too strong…then i added a lot of baked almonds on it..it actually made the cake less creamy! then i tried baking 2nd 1..with famous amos cookies and low fat cream cheese…whcih taste great..not too creamy.. I realise actually the crust can make the cake taste not so creamy and cheesy..so my crust is actually thicker than my fillings! Ur receipe is great!..giving me ideas to add on to the cake! Hey! How long can I keep the cake for after baking it? Can keep the cake for 3 to 5 days. Not sure if could keep longer than that as I have not tried before. Remember to put more gelatine else the cake might not firm up. Welcome you to my site. The gelatin used is in powder form which easily available in major supermarkets and baking supplies stores. It is in a nifty bottle. Tried & it is an easy&fast great treat! Look up the chill compartment of butters side..
i forget to put lemon flavor or vanilla essence too. it this doesn’t matter? Hi. Yes, gelatin is needed for non bake cheese cake. Just this non bake I did so far. Not sure the depth, but I am sure it is pretty standard measurement. Just take any 6″ tin to measure?